Cold Pressed. Borage Oil is one of the richest sources of gamma linolenic acid (GLA) containing up to 25% - which is more than twice the amount found in evening primrose oil. Clinical trials have shown that GLA helps to encourage healthy, mobile joints, and in skin care it provides excellent moisturising and revitalizing properties. Its regenerative qualities can be used to fight the loss of skin elasticity as well as tone and revitalize tired, dull, dry complexions. When used regularly, Borage Oil greatly improves the general condition of the skin helping to improve its texture and softness, which makes it an ideal overnight facial treatment. 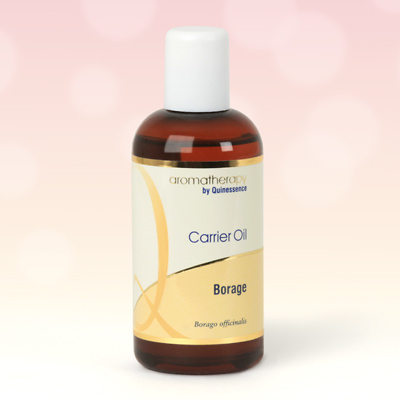 Borage Oil is quite rich, so add 15% to 20% of Borage Oil to another lighter textured carrier oil such as sweet almond or peach kernel to make it easier to work with in massage. For intensive night-time skin care treatments use it undiluted, so that your skin gets all of the nourishment and regenerative power from this great oil.